The FA have awarded Ashridge Park FC our Annual Health Check Certificate. After an even first half ends 1-1 with Reg Ryan on target for Ashridge, Windsor let the home team off the hook, creating several clear openings at the start of the second period, but failing to hit the target. Ashridge gradually ease back into the game and seal their fifth win in a row with a Reg Ryan penalty on the hour and a late strike from Dan Baker. Ashridge emerged victorious in the tightest of games to notch up their fourth win in a row. The blues fought back twice to go in 2-2 at half-time, before taking their turn to lead twice in the second half, with the Pumas unable to find an equalizer at the end. Another hat-trick for Reg Ryan takes him to 16 in eight appearances this season, with Antonio Baciu also on target. Ashridge make better use of the conditions as four strikes from range see them overturn a 2-0 half-time deficit on a vast, sloping pitch in windy conditions against fellow mid-tablers Westwood Wanderers Hoops. Reg Ryan finds the net twice with a little help from the home keeper, whilst Jack Gillingham and Dan Baker also net with spectacular efforts from outside the box. James Riley takes star player for his efforts at the heart of a hard-working rearguard action in the first half, coupled to some well-judged forward forays in the second. Over the past year or so we at Ashridge Park been gathering together old kits (and boots) to send to kids in Gambia. A scrappy encounter sees Ashridge emerge with the points in this Wokingham derby against the bottom side in Division 5. The home team concede a sloppy goal in the second minute, but quickly recover to lead 3-1 before letting their opponents back into the game with an own goal just before the break. Two second half goals are enough to settle matters. Reg Ryan grabs another hat-trick, with Jamie Cole on the scoresheet for the second game running, and Tayseer Alam netting the fifth. Marcus Coppen takes the star player award for some great creative play in midfield. Ashridge produce a sensational response after a rocky 10-minute spell finds them 3-0 down early in this match at second-placed Spencers Wood Hurricanes. Dan Baker leads the fightback with two goals as the visitors overturn the deficit to lead 4-3 at the break, before running riot in the second half. Top-scorer Reg Ryan bags four, whilst Jamie Cole, James Riley and Antonio Baciu are also on target. Curley Park survived a second-half onslaught from the home side to drag this cup-tie to a penalty-shoot-out. Reg Ryan found an equaliser for Ashridge on the hour after the visitors had taken the lead with a headed goal from a corner after 15 minutes, but the home side couldn't grab a second despite constant pressure. In the shoot-out, Joe Savory kept out the second penalty from the visitors to give Ashridge an early advantage, but Park failed to convert the next two to leave the visitors victorious. Ashridge throw away a game they dominated for the most part, failing to convert numerous chances, and then gifting two second half goals to their opponents. Reg Ryan scored twice to put Ashridge ahead in the first quarter of the match after Pinewood had led against the early run of play. 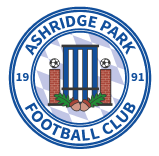 Ashridge overcome a determined fight-back from the home side on the first of this season's treks to the wilds of Middlesex, with Reg Ryan striking 5 minutes from time to earn our first three points. Earlier, newcomers Jack Gillingham and Tayseer Alam had given Ashridge a seemingly-comfortable 2-0 half-time lead, but a more robust performance from Teddington saw them draw level mid-way through the second period. Keeper Joe Savory takes the star player award for continuing to put himself in the line of fire even after taking a boot to the face when diving to collect at the feet of a marauding forward. A valiant rearguard action from the home side against an accomplished-looking Westwood side new to the league this season. An Antonio Baciu penalty following a foul on Reg Ryan saw Ashridge lead against the run of play, before a fine run and finish saw the visitors level before half-time. A scrappy effort following a corner put Westwood in front mid-way through the second period, before two late penalties gave the scoreline a more emphatic feel. Jack Clayton and Marcus Coppen were outstanding filling in for the absent James Riley in central defence, with Jack getting the nod for Star Player. New year, new season, new size pitches and goals, and offside!! Revenge for an ealier 5-0 defeat, whe we had just 8 players. Hot, Cold, Foggy definitely Amusing! U18 Park record their first win of the season, against a side that had lost only one match previously. Come and buy some tops, shorts and all sorts of Ashridge branded goodies. What a throw in. A new year, and throw ins. No roll ins, throw ins. #BOOM! Summer may be time off school, but park are hungry for football so we did some friendlies. Under 17 Park played only their second match in 7 weeks, away against Abbey Rangers. Due to various circumstances we started the match with just 9 players. To the players fantastic spirit the 21 minutes that passed until the 10th player arrived the match was still goalless. We played the rest of the match with 10 men. Plate runners up at Goals. Another week, another crucial match. This time, it was a visit to Laurel Park, our main competitor for the runner’s up spot. We had drawn with them in a lively encounter at St Crispin’s earlier in the season, and their abilities were well established illustrated by a run to the semi final of the Cup where they had defeated three First Division teams before finally succumbing to the League’s dominant outfit.Ashridge were slightly under-strength with 2 players missing injured, so the bench had 3 players on it, compared with the five on the home team’s bench. A familiar story as we played a match with 10 men again, no ones fault just the way things have been this season. This is if I am correct the 5th time this season we did not have a full complement. After 2 disappointing defeats we faced a tricky looking encounter with an impressive AFC Caversham team. With the squad down to its bare bones of the mere starting 11, many of whom were still shaking off the after-effects of a lively Friday evening, and a vast muddy undulating pitch, we were fearing a tough morning. So, remarkably, we find ourselves hosting our final league match of the season on a deceptively chilly February morning. There are still 4 tricky looking away fixtures to go, but this is an opportunity to go out in a blaze of glory. Early portents were good, with Dan’s long ball setting up Alex for a one-one-one with the stand-in keeper, who unfortunately saved the goal-bound effort. So the moment of truth! We travelled to table-toppers Reading Rangers, unbeaten all season, with the objective of winning all three points to match their points tally for the season, and throw the championship wide open. Anything else, and realistically we would be looking at best at a runners up position in this, very successful, season. Another back to the wall display. We started with 10 and finished with 9. We conceded 3 bizarre goals (for different reasons) having taken the lead. The match turned on a unbelievable chain of events in the second half. A bitterly cold wind tested the supporters endurance. The match started poorly for Ashridge as they conceded a goal after 2 minutes to a simple through ball. We struggled to get into the game and Reeves had more chances to increase their lead. After yet more overnight rain, the pitch was deemed to be playable for an encounter with an in-form Caversham Trent team. The key to success in this match was to start well and put the opponents on the defensive. After torrential rain had lead to the postponement of an entire schedule at St Crispins, we were surprised and delighted to find such the pitch in such excellent condition at Camberley. The pitch seems quite long and narrow, and it was necessary to adapt our tactics accordingly. For the second week running just 11 players available for the match, and for the second week running the 11 won stretching the unbeaten run to 5 games. We finally returned to League action after a few weeks of rain with the visit of a much improved Elstead Sharks. We had beaten them by a large margin early in the season, but they had recruited 6 new players and had won 3 of their last 4 games. Today we welcomed a strong Laurel Park side to St Crispins. Traditionally Laurel Park had been something of a bogey team of ours, and with the visitors already progressing to the quarter final of the Cup after vanquishing two Division 1 teams as well as a Division 2 team, it was clear that we would be in for a difficult encounter. As temperatures plummeted across Berkshire, the U8 Royals did their best to give big guns Bracknell Town Lions a frosty reception during Saturday’s cup clash at The Crispin’s Arena. Police would like to hear from anyone who observed this pudding at The Crispin’s Arena on Saturday morning. ​The wintry weather was no match for the hardy souls from Ashridge Park FC, who manned our first ever stall at the Wokingham Winter Carnival. The stall was a huge success, raising further the profile of our club as a vital community organisation, which provides a safe and fun environment for around 300 local children to play football. Park travel to near neighbours Bracknell Town on Saturday 28th November with a full squad. Kick off at Brch Hill Rec, Ringmead, Bracknell, RG12 7AQ is at 10:30am. Players meet 10am. After one week’s lay off due to the weather, we welcomed Shinfield Rangers to St Crispins on a pleasant winter’s morning. As the team cars threaded their way through the inner city, navigated through the urban jungle of Berkshire’s Capital, little prepared us for our destination. Park in the rear playground and follow the fence around the back of the school they said. Away @ Pinewood this Saturday, although due to the wet week beforehand a change of venue to our training venue at Edgebarrow. After a couple of disappointing defeats it was important for us to return to winning ways with a trip to Whitegrove Pythons, a team we had not encountered since our memorable Semi Final victory some 6 years ago. The game was moved to Bracknell as the Whitegrove home pitch has been taken over by the local travelling community. After 36 hours of sporadic downpours , on a rain sodden pitch, and under an ominous looking grey sky, we prepared to welcome our highly rated Division 2 visitors from AFC Henley. So on to the big one. A top of the table clash saw early season pace-setters Reading Rangers coming to Ashridge to defend their 100% record. all three under 8′s sides were at the home stadium on the same morning and all three Park, Royals and Rovers had great results. On a chilly autumn morning we made our first ever visit to Caversham to play Caversham Trents, a team that had just joined the League after playing the past few seasons in the Berkshire Youth Development League. On a perfect morning for football, Ashridge started the game with no little purpose. Within the first 5 minutes we already had 4 corners, on 6 minute Dom missed narrowly with a diving header from Owen’s cross, Ben W 20 yard drive was saved well by the keeper and then Ben C’s shot from 30 yards was caught by the busy keeper. The score does not reflect how well the team played. It was another tight match with the team working well together, taking the coaching on board passing into space and playing great attacking football. Today saw the 1st Round of the Cup on a fine autumnal morning. Bracknell Cavalier Saints had been very strong opponents last season, convincing 3-0 victors at St Crispins last October and 2-0 winners in the early stages of the Ashridge Park post-xmas renaissance. Well we made it, all the way to the inner city. Teddington. I know its a long way from #woky, but the boys were up for it and excited about playing so far from home. It was a great match on a good pitch, all in all we had another great morning of Football. Today we welcomed our rivals from Sandhurst, the only opponent in this season’s division that we played last season. We expected Sandhurst to be well-organised defensively, and we had to make any opportunities count as chances were likely to be few and far between. We were also wary of their noted prowess from set pieces. We travelled to near-neighbours Twyford Comets for what was surprisingly, our first ever League encounter, in this, our opening game of the 2015/16 season. There was a full complement of players, and with 7 goals scored in our 2 pre-season games, hopes were high. With the extension of our under 8′s to three teams, meet our newest management team leading the Rovers forward, Dr Martin and ‘Big’Alan.